Yesterday was a very, very happy mail day. There I was, beavering away like a goodun, working from home, though at just about tipping point from the bloody noisy builders banging about next door, when not one, but two substantial thuds landed on the front door mat. My fuse was half blown and I was about to yell at the usual runaway estate agent delivery boy, when I remembered what could possibly be in those two packages. This is the second batch of cards I’ve ordered from Moo. The third if you count the ones I ordered for Mr O. 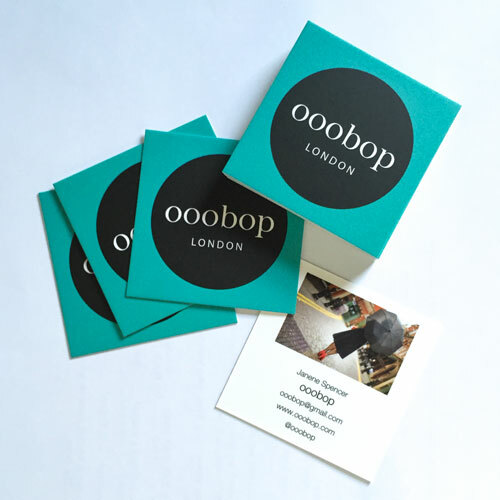 The first ooobop ones were way before I’d decided on my identity and so I’d ordered the cute little mini ones. But they’ve since run out. I secretly wanted them to run out when these fabulous new square formats were introduced to the range. My logo sits so perfectly in the middle and there’s plenty nuff room on the reverse to add details plus another image. Plus, they properly match my garment labels too! If you’ve never used Moo before I wholly recommend them for a fabulous service and great quality. There’s even a real person on the end of the phone if you need any help. Though the process is a very simple step-by-step online operation. And I get rewarded in ‘moolah’ if you place an order. And so do you once you’ve placed your order and recommended a friend. I don’t make any money from my sewing but I do make lots of friends. Like for instance I got chatting to a lovely lady the other day on the bus who was knitting with some fabulous yarn that looked like pencil shavings! I couldn’t resist asking her about it and within seconds we were chatting all things sewing and knitting. She had run out of cards but luckily I managed to dig out the last remaining dog-eared one from my bag just before she had to get off at her stop. It was then that I realised how useful they are and how I must get some new ones. I’m never quick or dexterous enough to tap in a new contact on my phone in a hurry. I come over all fingers and thumbs, so these are perfect! And so what could possibly be as exciting in the next package? I can’t tell you how long I’ve waited to get a copy of this film. 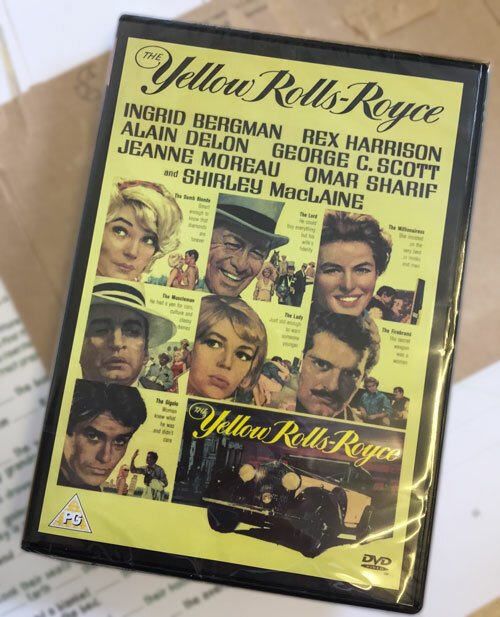 I don’t even know anyone else who’s ever heard of this film: The Yellow Rolls Royce! Anyone? Anywhere? The last time I watched this film was nearly four decades ago so I was hoping my love for it wasn’t a romantically distorted view! How could it be. Check out the all star cast: Shirley MacLaine, Omar Sharif, Ingrid Bergman, Rex Harrison, Jeanne Moreau, George C. Scott, Alain Delon, with surprise appearances from Art Carney, Joyce Grenfell and Lance Percival! So why does this news belong on my sewing blog (besides the fact that I love watching an old movie while I sew)? Well. As I watched, and I indeed loved, I remembered exactly why I truly loved it so so much. Not just because I absolutely fell head over heels for Alain Delon at a very illegal age, I also totally fell in love with Shirley MacLaine and her wardrobe. She was a gangsters moll. ‘Fidanzata’ to George C. Scotts character of Paolo Maltese. And even at that age I wanted her clothes, her hair, her make up: tight wiggle skirts and dresses, stripy halter tops, swing skirts and chiffon scarves. Black, white and red, candy pink with black trim, polka dots, chiffon and fur. Pretty sure they were faux!! And there was me thinking it was all about Alain. Ha! I’m going to watch it again and again until I’ve clocked every item in her wardrobe and then make them all! I just adore all the black buttons down the back of that pink dress. Mine would be red of course! And if you click the source for the image below you will get a little clip of the movie so you can see where I’m coming from! I could just watch this film over and over. In fact I just watched that clip 3 times! This will now be my favourite movie to sew by. Do you watch movies while you sew? What are your besties? I love the little square cards!! How have I missed Victor Victoria? Must check that out! It is frickin’ awesome, and such costumes!!! It suffers a litle from being made in 1981 so characters sit around analyzing stuff a bit, but Lesley Ann Warren makes up for it with her spectacular high kicks! Such fun!! I love your cards! I should get me some. A lot of people have asked me if I have one to give; it’s a great way to share a blog address! I just wish I had thought up a more creative blog name for myself. I guess I still could, but I am not savvy with setting up a blog. I don’t think I could even duplicate what I have managed so far! Ooh, those cards are beautiful. I’ve ordered from Moo before, just the standard business card sized cards, but have been eying up these square ones myself. Thank you Sam. They feel very special and it’s a pleasure to hand them out! 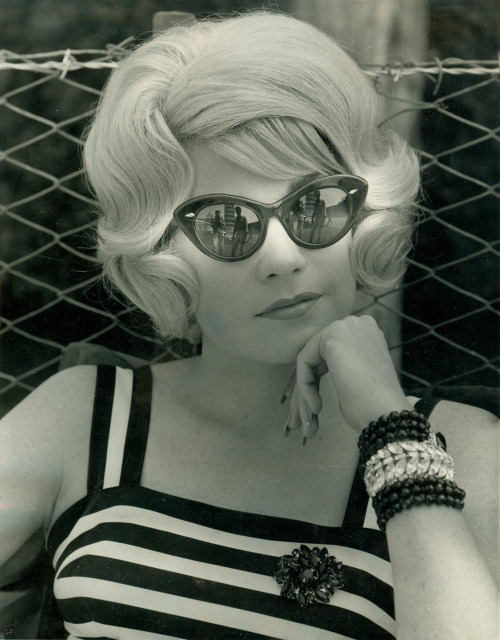 I love those stylish 60’s movies. I’ll have to put this one on my list. I don’t usually watch movies as I sew; I’ll stream tv shows from Netflix or listen to podcasts. I love to have some cheesy true crime show on in the background. Ooh yes – I had forgotten about that film so thank you for reminding me. A happy mail day indeed! I’m making a mad dash to my Kindle to see if I can download The Yellow Rolls-Royce as I write. Thanks for the tip! Yay! I just downloaded it and I’m gonna watch it today. Great costumes. What fantastic post I can see why you were so happy. Your cards are perfection in the square format. Thank you. They are a pleasure to hand out! Oooo I’ll have to check it out looks fabulous! The movie I’ve been sewing with over and over recently is Pillow Talk with Doris Day 🙂 I just look up whenever I know the next amazing outfit will be shown! When I get sick of that it will be back to Funny Face, Breakfast at Tiffany’s, Charade or How To Marry a Millionaire.